I chose to play Cosmic Predator to end my short-lived SHMUP September. 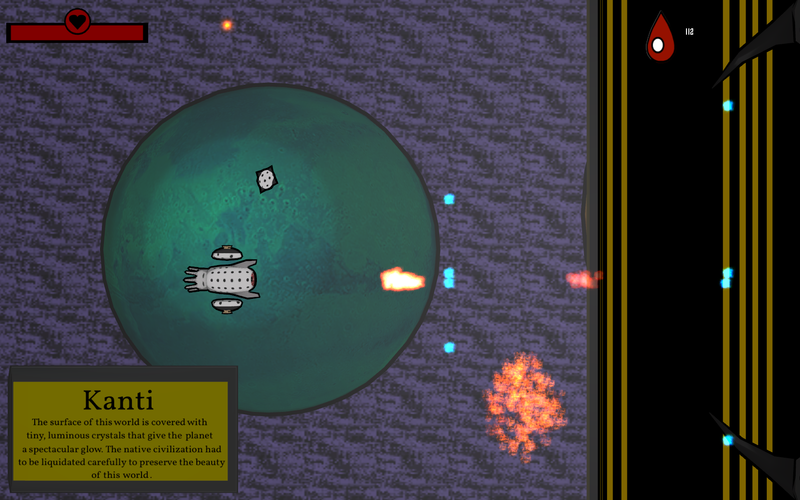 This shooter follows the traditional SHMUP format: you pilot a ship (or alien being in this case), fire at enemies, upgrade your ship, and either finish the end boss or die in a blaze of glory. Killing creatures as a creature while in another creature. In Cosmic Predator you are a creature of some kind, hurtling through space as you try to get the Life Stone back to save what’s left of your people (“the last of your people,” another trope of this genre). 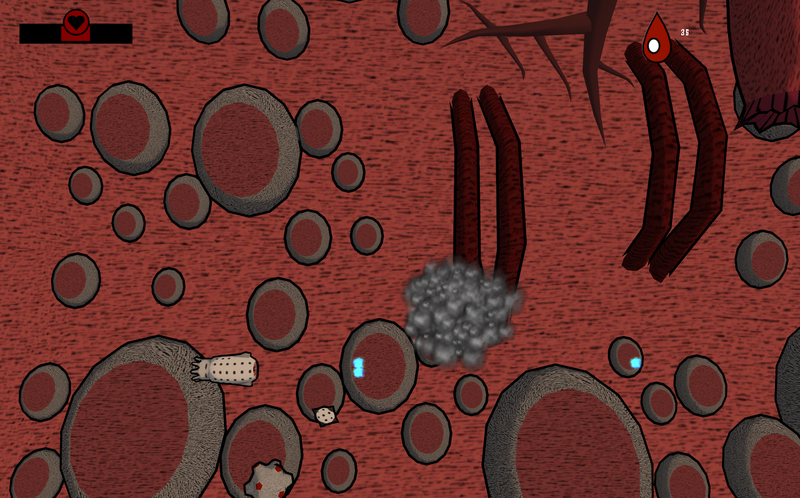 As a sort of “fuel” game mechanic, while you’re taking down the evil corporation that took the Life Stone, you are constantly bleeding or something because in order to stay alive you not only need to dodge bullets and scenery, but also drink the blood of your enemies. 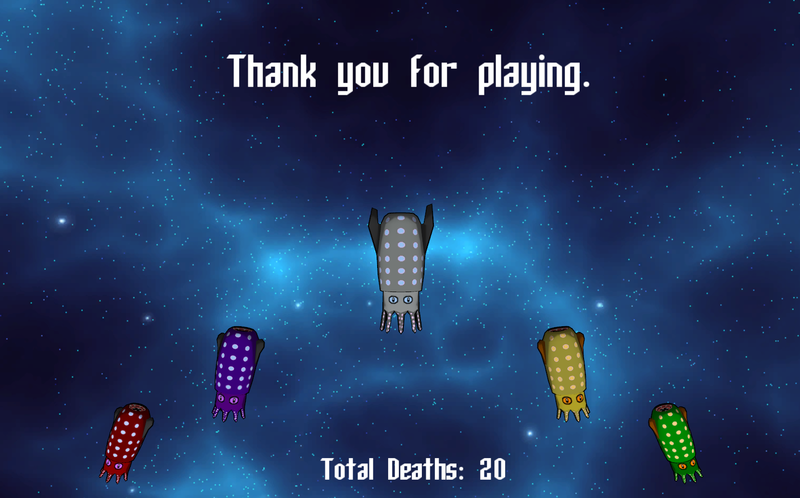 If your health bar empties completely, your little dude passes out and dies, left floating alone in the cold darkness of space. The other twist in this game is that upgrades happen at the end of each mission; you get to choose from regular bonuses such as a ball of protection that hovers around you or a powered up shot that is rather self-explanatory. You cannot alter these upgrades one you have selected them, so your decisions will affect gameplay in later stages. There isn’t anything that will outright ruin the experience, though some areas would be easier depending on which upgrade you pick. One of the best quality of life improvements is an upgrade that pulls the blood of enemies you kill to you rather than making you chase it down. When this is your main way to keep being not dead, this is huge. One major downside to the game as a whole is that there is no native controller support. The keyboard works okay, but until this I hadn’t played a full-fledged game without a controller, unless it was a first-person shooter, in ages; it felt odd to not have this as a built-in option in this day and age. I talked to a friend about this game, and the instant I mentioned the controller thing, he lost his interest in playing. The game is funny if you look for it. There are times, particularly during boss fights, when you know that there is no way to defeat a boss before your health bar fades into nothingness and you’re helpless to prevent this. It’s frustrating because the action moves fast enough to where you don’t watch your health meter all that closely and your character stops responding to your movements because he died at some point. Some additional enemies to refill the health meter would be an amazing improvement. On the positive side, you don’t have a limited number of lives; you can keep going to your heart’s content. Stages are broken up into sections, so if you die you don’t have to go all that far back to reach where you were. On the harder difficulties you will die a lot. In the later parts of the game you’ll find some good humor here and there on the evil corporation’s signs. The game isn’t bad, really, but it doesn’t make me want to go back for more. There’s nothing groundbreaking here, but fans of the genre will likely have fun with this title. Cosmic Predator was developed by Steel River Games. For a mere $4 you can help save your people by shooting energy weapons out of your nethers.